Cornish Rex cats are known for their curious, mischievous personalities, high intelligence, and short curly fur. Cornish Rex cats have short, soft, curly hair that has a plush-like texture. Their slim, long-legged builds, and slender tails, large ears, and wedge-shaped faces give them an elegant appearance. Overall, the Cornish Rex is a medium-sized cat, though dense with muscle. Cornish Rex cats can be distinguished from Devon Rexes because their coats are denser and they are not as likely to develop bald patches. Cornish Rexes are also heavier and more muscular, so their differences from ordinary cats are less pronounced than those of the Devon Rex. The first known Cornish Rex was named Kallibunker. 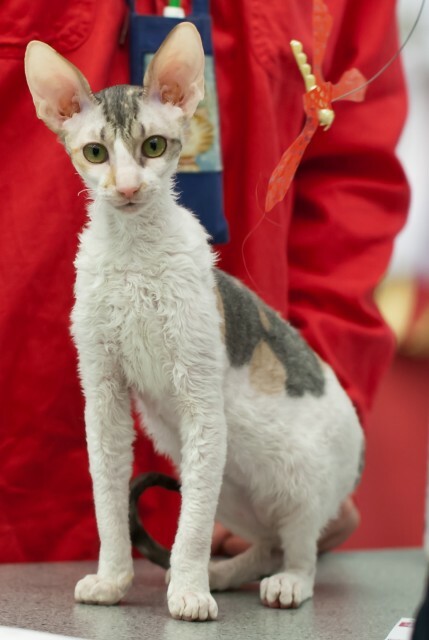 Born in 1950 to a tortoiseshell farm cat called Serena, Kallibunker had the unique short curly coat that characterizes the Cornish Rex breed. No one knows who Kallibunker’s father was, but it’s likely that he carried the mutated gene responsible for the Cornish Rex, so it’s believed that the breed actually originated in the 1940s. Initially there were very few Cornish Rexes, and there was concern that the breed would not survive. To further establish the breed, Kallibunker’s son, Champagne Charlie, became part of a breeding program involving Burmese, British Shorthair, Russian Blue, and Siamese cats, until he was killed in a cat fight two years later. The Cornish Rex cat breed is caused by a recessive gene. This means that both parents must carry the gene to produce a Cornish Rex cat. Cats that carry the Rex gene may look perfectly ordinary, but if two carriers breed, 25% of the kittens will get the gene from both parents and look like Rexes. Another 50% will look like regular cats but will carry the recessive gene, making them capable of producing Rex kittens with another Rex gene carrier, and 25% will not have the Rex gene at all. Active, energetic, curious, extroverted, and clever, Cornish Rex cats often get into mischief, but they are also very interactive and friendly. Rexes tend to be lap cats, and because their fur is short, they are also inclined to snuggle up for warmth. Some Rex cats like to ride around on the shoulders of their favourite humans, and most are talkative. Cornish Rexes are one of the “doglike” breeds. In addition to tossing toys around, many like to play fetch with their favourite playthings. Although they appear elegant and dignified, Cornish Rexes tend to be amusing, playful, and not at all aloof. They are good problem solvers, using their nimble paws to get into drawers and cupboards in order to satisfy their insatiable curiosity. 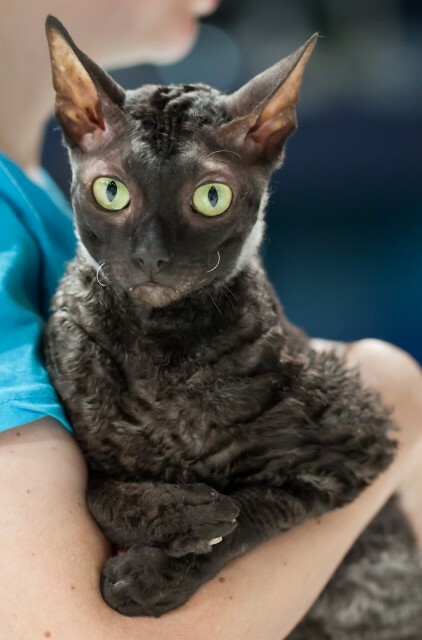 Are Cornish Rex Cats Hypoallergenic? Many people assume that Cornish Rex cats are hypoallergenic because their fur is short and tight and they don’t shed as much, but they actually produce just as much of the allergenic protein as other breeds. Some people are better able to tolerate Cornish Rex cats than those of other breeds, but others find them just as likely to provoke an allergic reaction. Spending some time with a cat before adopting to check for allergic reactions is recommended. Cornish Rex cats require regular bathing to remove oil build-up in their fur. All cats produce these natural oils, but because Cornish Rex cats have much shorter fur, these oils can make their coats appear greasy and may even lead to skin problems. The frequency of bathing will vary from cat to cat. Some Cornish Rex cats only need a bath very occasionally, whereas others will require weekly bathing. Those who adopt Cornish Rex kittens should begin getting them used to bathing at about 16 weeks of age. Adopting a purebred cat can be expensive. Cornish Rex kittens may cost anywhere from $350 to more than $1,000, depending on breeder, bloodlines, colours, patterns, gender, and overall show prospects. Those who want to save money and provide a loving home for an adult Cornish Rex in need can obtain one through a Cornish Rex breed rescue organization. A directory of Cornish Rex rescues and general purebred rescues can be found at PurebredCatBreedRescue.org. Ash, Catherine, Cat Fanciers’ Association. (12 June 2008). “Breed Profile: Cornish Rex.” CFAinc.org. Helgren, Anne, J. (n.d.). “Choosing a Cornish Rex.” PetPlace.com. Jones, Eve Denise. (2002). Cornish Rex Cat. Surrey, UK: Interpret Publishing.